I am obsessed with this album. Utterly obsessed. Indigo Meadow by The Black Angels is one of the five best albums of the last ten years, and I can’t stop listening to it. I’ve had it for two weeks, and I’ve listened straight through it 14 times, and I’ve heard my favorite tune, “You’re Mine,” 23 times. The Black Angels are an Austin, TX band, and they are part of the modern psychedelic movement that probably owes it existence to The Brian Jonestown Massacre‘s burst of creativity in the mid 1990s. It’s a genre that loosely includes bands like Black Rebel Motorcycle Club, The Warlocks, the above-mentioned BJM, and newer bands like The Spyrals and my former band, The Atomic Love Bombs. Indigo Meadow is the fourth studio album from The Black Angels (not counting EPs). It very much builds on the sound of those earlier albums (2006’s Passover, 2008’s Directions to See a Ghost, and 2010’s Phosphene Dream), but it also shows that the band is not afraid to grow, to let that sound expand in new directions. The biggest difference is that Indigo Meadow is an album of melodies. Beautiful melodies, poppy melodies, drony melodies, interesting melodies, fun melodies. Great melodies. The band’s first two albums were built around drone and fuzz. The vocals tended to soar along above the music, even while hiding amidst the instruments and allowing the drone and fuzz to reign supreme. The vocals were often distant. Phosphene Dream saw the introduction of more melodic and pop elements in the music, but the vocals were still distant, still getting lost among the instruments. That’s not criticism, mind you. I love those first three albums. A lot. It’s just that Indigo Meadow is better still. With Indigo Meadow, the vocal melodies lead. They’re front and center. They’re married to the music, but the vocals are wearing the pants in the relationship. The drone and the fuzz are still there, and sounding better than ever, but it’s the vocal melodies (and harmonies) that make this album so wonderful. Take “Your Mine.” This is one of the most infectious tunes I have ever heard, and it was the first song on Indigo Meadow that I couldn’t get out of my head. It’s like this song is my friend. It’s there and it wants me to be happy, and to make me happy, it plays itself. Yeah, I know that sounds crazy. I’m OK with that. The title track is also haunting. “Put your hands on my chest, girl.” It’s a refrain that lead vocalist Alex Mass repeats in various forms throughout the song. The same with “Be strong. I wish that you were.” There’s something about that line I just love hearing. There’s also this moment in the song that stands out starting at the 1:28 mark. The music gets stripped down to bass, keyboards, and drums. The vocals feel close, intimate. This is a different thing for The Black Angels, where there has always been an omnipresent noisy element to the songs and that distant thing I mentioned above. Indigo Meadow has only a couple of these quiet and close moments, and they are the more enjoyable for their rarity. “Don’t Play With Guns” is the song I currently can’t exorcise from my brain. It has a very catchy chorus built around the words in the title. The thing that I keep thinking about is the bridge, especially at 1:30 when the vocals take on a sing-song quality that I keep finding myself chanting. That sing-song melody is repeated again in the outro where it pairs especially well with the chorus. Good stuff. Here’s the band’s post to YouTube for this song. There’s a 70s feel about “Holland” in the bass and keyboard intro, but the tune slips firmly back into the 60s once the rest of the instruments and vocals kick in. This was an early standout tune for me. The band taps into the fundamentals of groovy with “Always Maybe.” This song is just groovy. Baby. It also has this killer fuzz guitar line starting in the second verse. The song is gorgeous and lustrous. The album ends with “Black Isn’t Black,” and it is such an awesome song. It has this cool bass and vocal intro with some delayed guitar effects that sometimes play in the distance. It’s hypnotic and cool. It’s hummable. It’s great. It reminds me of some mid-period Love & Rockets, or maybe some of Daniel Ash’s solo work, even though it sounds entirely like The Black Angels. And then at the midpoint the fuzz bass kicks in. The drone kicks in. The thumping drums kick in. That distant, above-it-all vocal that is the band’s origin kicks in, and it’s totally awesome. Indigo Meadow is 13 songs, and every one of them is memorable, interesting, and they sound great. As of this writing, I have all those songs rated at 5 of 5 stars in iTunes. Few albums are great start to finish, but this is one of them. This entry was posted in Blog and tagged Music, Review, The Black Angels by Bryan Chaffin. Bookmark the permalink. Heheh. Thanks, Chuck. I am tickled you rather enjoyed them and appreciate that you checked them out! I look forward to hearing your thoughts. I found you randomly. 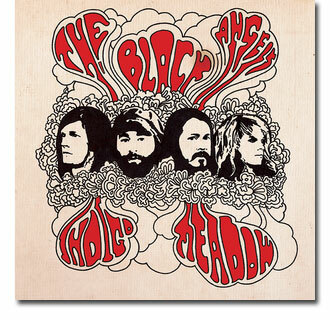 I listen to The Black Angels obsessively. I first discovered them when I watched ” Death Sentence”.. It was an ok film but I looked at the soundtrack because I was awed by the 2 Black Angels tracks in it. So, I started with Passover ( still remains my personal favorite) but I love all their stuff. I admit to being confused by Indigo Meadow for the first few listens. It seemed so different than their previous stuff and I was not sure that was a good thing, but it grew on me quickly. I’m dying to see them live! Anyways, comments from a stranger in Oregon. Howdy, stranger from Oregon! Now I’m interested in checking out [i]]Death Sentence[/i]. I get being thrown off by [i]Indigo Meadow[/i] at first. I loved it right away, but it so very much has a different feel to it compared to their earlier albums.